This week, for our The Cutting Cafe design team project, we got to play with the Assorted Pop Up Cards file. It comes in two formats, with a single pop up or a triple pop up inside. I chose the single pop up. I also combined it with the Grad Hat Shaped Card file. 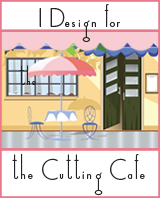 Be sure to stop by The Cutting Cafe Blog on the 7th and 21st of each month to view the design team posts. Leave a comment and you will be eligible to win three free files of your choice. Happy New Year! Welcome to my first post of 2017. This post marks my fourth anniversary as a design team member for The Cutting Cafe! Check out my very first post for the team here. I still have that project proudly displayed in my craft room! I have loved bringing you projects for the shop and hope to continue to bring you inspiration for a while to come! With that being said, for our first project of 2017, we were tasked with doing a clean and simple card using the Everyday Greetings Printable Stamp Set 1 or the Everyday Greetings Printable Stamp Set 2. I used the first set and used two sentiments from the 1a set. I used additional Spellbinders shapes on the inside and matted a second sentiment from the file. Here is a close up of the inside sentiment. I love the embossed hearts! Be sure to stop by The Cutting Cafe Blog to see all of the design team inspiration! We post projects on the 7th and 21st of each month! When you stop by, leave a comment and you will be entered into a drawing to win three files of your choice! I made this cute birthday card for one of my husband’s staff members. I used the BIrthday Fun Stamp Set from The Cutting Cafe Shop, which is the sister store to The Cutting Cafe. You can find clear stamps, ribbons, paper, clear cardstock, and other embellishments. Also, you can have custom stamps made! I used the cake and candle from the stamp set and the outline shape SVG file that comes with the set (it comes in PDF and other versions too). I added clear Wink of Stella to give the cake a frosty look and yellow Stickles for the flame. I used a Spellbinders die set in peach and cream and gold metallic paper on top of a cream base. I added little gold Dazzle gem stickers in each of the circles of the die cut. Both the sentiments on the front and on the inside are from the stamp set. For my design team project for The Cutting Cafe this week, I used two files, The Shirt and Tie Cutting File and the Different Ways to Say Dad Background Printable Stamp. I added buttons and metal paper clips that say love you. The pocket and hankie are part of the file. I think it came out adorable. Be sure to stop by the blog and see all the design team projects. This week we could use whatever files we wanted to so there will be quite a variety. Here are pics of the inside and back. I used an Anna Griffin die for the Dad on the inside. Inside – I will add a poem on the right side. The back features the Different Way to Say Dad Background Printable Stamp. This week for The Cutting Cafe design team, we worked with the Big Expression files which have both printable stamps and cutting elements to them. Make sure you visit The Cutting Cafe Blog to see the rest of the design team projects. We post them on the 7th and 21st of each month. Leave a comment and you will be eligible to win three free files in a random drawing on the next design team post date.